Wallpaper has been used for walls and ceilings in the period home from the Georgian era onwards. The first users of wallpapers were people trying to create the effect of tapestry and textile hangings; they tended to be the wealthier middle classes. However by the mid-18th century it was used by royalty and the upper classes. In fact it was regarded as fashionable for the first half of the 19th century. In the mid-19th century, mechanisation made wallpaper cheaper and available to the masses. However, higher quality papers such as those printed by hand or with special finishes such as flock continued to be expensive and the preserve of the better off. Each householder used the higher quality papers in more impressive styles in public rooms with cheaper papers and designs used in bedrooms, bathrooms and kitchens. The dominant colour in the wallpaper was then used for the woodwork. 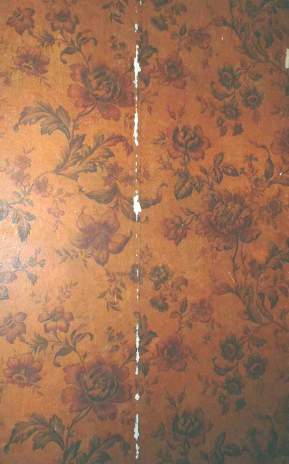 The sample below is a 'sanitary' wallpaper, dating from about 1890. 'Sanitaries' were so-called because the production process made them wipeable or, when varnished as so many of them were, completely washable. They were used mostly for hallways, kitchens and bathrooms. The pattern on this one, though, is perhaps more suited to a bedroom or drawing room. See the Gallery for other examples of wallpaper. See the section on Colour for examples of colour palettes used in different eras and with different styles. See individual rooms in Design by Room for specific comments.